This post is sponsored by Finlee and Me. A while back I started seeing people online playing with something called, "Kinetic Sand". It looked like quite an incredible substance from what I could gather, so when I was contacted to see if I'd like to try some out, I didn't hesitate. Kinetic sand is made up of 98% actual sand and 2% "magic". (That's what the box says.) That 2% is some sort of polymer that makes it able to stick to itself like wet sand would, but be completely dry and constantly re-usable. Kinetic sand is mouldable and allows for very crisp, precise designs. It crumbles down like real sand would but has a strange flowing movement. Quite hypnotic to watch. The best way that I could describe it is like playing with a combination of wet sand but not wet, and brown sugar but not sticky. It's pretty hard to compare to other things though, because it really is like nothing we've used before. You just have to try it yourself. Will never dry out. Just keep it in a container to keep dust out. Here are just some of the ways that we have been playing and learning with our kinetic sand. Whilst creating something specific, forming a dialogue about it helps with language development. She was creating a dam and it had to be even all the way around. My 5 year old loved chopping away at bits of it. It seemed magical in the way that the sides held their form. Chopping through a pile of what looks like loose sand. It felt like the parting of the red seas. Amazing stuff. We talked here about separating things and about 2 equal parts. Every adult that came to my house couldn't resist playing with it. We discovered you could roll spheres out of the sand and roll them without them coming apart. We tested all sizes and found this largish marble size was about as small as we could go. Building challenge.. using the 1kg we created a marble with marble run.. that worked! Can you? A full kilogram of kinetic sand rolled into a ball. Because of the weight, it will only last a little while before cracking and then slowly floating apart. I wasn't quick enough to get a picture before it cracked. We discovered that when not packed really firmly, the weight of another cube on top started to make our first cube sink. We talked about weight, size and quantities. All with a 2 year old. Making patterns in Kinetic Sand with shells and seed pods. Kinetic sand makes the best imprints. Have a go at imprinting all kinds of things in it. We loved the intricate detail and patterns of these seed pods. 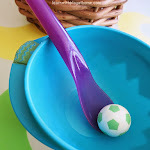 Toddler Life Skills: Scooping and tipping. Spoon work. Kinetic sand is so good for this! Toddler Life Skills: Spreading. We used some pretend bread and a plastic knife to spread "butter" on the bread. It worked really well. Toddler Life Skills: Knife skills, cutting. SO good for cutting. It's quicker to roll into shapes and get back together than playdough. Counting and learning numbers. We made little mounds and counted out and stuck different amounts of cottonbud sticks (Q-tips) in them. Imprinting letters to form words in Kinetic Sand. Cool! I loved how the sand didn't get stuck in places as it is better at sticking to itself. Moulding letters out of Kinetic sand. Great for learning letters, your name, spelling, sight words etc. Writing in Kinetic Sand. 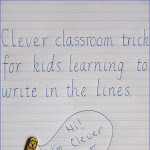 Great for practicing writing and handwriting. A fun novelty and leaves a good clear line so that children can learn to form their letters correctly. They are just some of the ways that we have been playing and learning with our Kinetic sand. There are so many possibilities when you have open ended materials like these. You can go here to purchase your own lot of Kinetic Sand. There are cool modelling tools available as well! Finlee and Me are a great Australian online kids shop specialising in lovely and unique stuff for kids and babies. Thanks to them, we have 3 x 1kg Kinetic Sand packs to giveaway. If you could choose any toy for your child from Finlee and Me. What would it be and why? Conditions of Entry: This competition is now over. Congratulations to Linda Cleary, Mel Wylie and Sonia Randhawa. This is not a game of chance. This is a game of skill and the 3 most creative responses, as judged by us will each win a 1kg box of kinetic sand including postage within Australia. If you leave an ANONYMOUS comment, please remember to leave a name. Entries open 9am (AEST) Thursday 22nd of May, and close midnight (AEST) Thursday 29th of May. Winners will be announced the following Wednesday, 4th of June on this post. 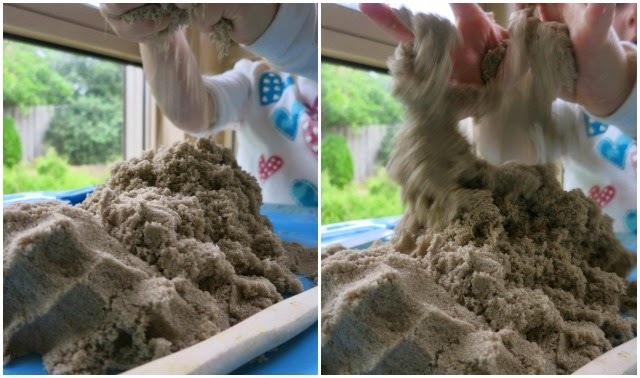 Have you played with kinetic sand before? What did you think? to add this to our box of tricks, would make our play room even more slick. These- 2D Animals Balloon Balls- are one of my favourite toys. Light and easy for toddlers and other small people to manage, no problem if they go flat and great fun for grandmas to share playing with too. Just love the Animal Red Balloon Ball - kids at my playgroup LOVE balloons so this would go down a treat - not literally and that is the BEST part. I love the "52 Activities for You and Your Toddler" because my toddler and I can have loads of fun spending our quality time in a useful way and also it will keep my very active toddler occupied. WOW how awesome is that sand, my boys would LOVE that! I absolutely adore The Family Box because it is hard to find character figures that are so open ended. I am a big fan of toys that can be used endless ways and I can see so many uses for these with role play with other toys, imaginative play, even tea parties and alongside the blocks... love them. 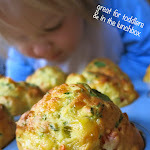 The 52 activites for your and your toddler would be fab! my littlest man follows his older twin brothers around like a puppy to play and these would be great to have structure in his and their play! My kids would use every little bit. The kids would have such a ball. There is no end to what they could make. They could take it anywhere. It would have to be the Idea Box Activities for Kids. I have a couple of toddlers and lots of nieces and nephews and I hate seeing them playing electronic gadgets this way when together they could choose a disc, complete a challenge, have lots of fun doing things they wouldn't normally sit down to do inside or outside regardless of what age they are it's fun over and over again. Congratulations. Your answer has been chosen as one of our winners. Please contact us at learnwithplayathome at gmail dot com with your name and postal address. super keen to try out the kinetic sand at home. It looks amazing! My little girl would absolutely adore the 7ft tee pee. She loves her solitude and sanctuaries. The twinkle twinkle kids tee pee. It looks so warm and inviting, lovely for wintery days to snuggle up inside, read stories and recount our adventures...dreamy. Bring the soda bubbling classroom lab to our kitchen with 52 Amazing Science Experiments. In a Flash we will creative super science fun....kaboom! In the current Finlee and Me email newsletter there is a plate that has lots of little sections with congratulatory messages printed at the bottom of each. Not only would this be fun for master 5, but the idea of him not whinging through every meal makes it a priceless item. I'd buy Kinetic Sand! Why? Because you just showed me all the wonderful ways my children (and secretly myself) can use it. I can;t always get to the beach so this is the next best thing. Keeping him quiet and still is hard so we need more toys! The Fabric memory games look fabulous! 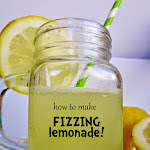 Easy to pop in your handbag to take to a friend's house, grandma's or even a restaurant. Better yet it would be a great toy to pack for holidays. Love it!! I would chose the teepee (looks like the perfect place to escape to when kiddo is having a 3 year old tantrum) but suspect if kiddo got to do the choosing it would be a build on the go bag. to provide hours of laughter and so much fun. for those special nights and all throughout the day. He takes the sticks and hits and hits... I'm fed up with all those little bits! Stick-lets Fort Kit could be just the thing to change destruction to construction. It's on my wishlist now, let's see, if it will build not just walls and doors and things of wood, but peace and quiet, some space for me. After browsing through so many lovely things on the Finlay and Me site I didn't think I was going to be able to decide what we would LOVE the most... until I saw the Rainbow Fairy Door (http://www.finleeandme.com.au/product/fairy-door-rainbow/)! We have recently built a fairy garden in our yard so a little door to ensure that they could also come inside would be lovely. 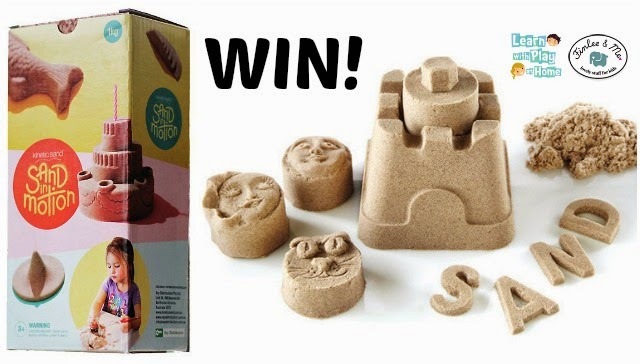 I know if we won a box of awesome Kinetic Sand we would get hours of fun from it too! The dancing ribbon rings would be a big hit at our house! My daughter loves music and dancing around with these while we're playing music would be tons of fun. I love the idea of the "And Then" story cards, for my creative little girl! Bananagrams would be my choice. To be honest, as a mum, some toys I'm not very into playing with my kids. But this one is my favourite toy. It can help kids learn how to spell words in fun way. It's portable so we can play it on our travel way. Every time we play it, different result will come out, so no one knows who will win. I struggle to get my son away from electronic entertainment but I think the lure of 52 Amazing Science Experiments might do the trick! Rainbow bean bags. I'm a long day care teacher and we use the bean bags in so many different ways. From looking at colour, play doggy where's your bone, catch/ throwing games just to name a few. I saw kinetic sand in our toy catalogue but wasn't in our budget. I'm super keen to get some and let my toddlers go for it. For me simple is best and that is why I would adore the 5 Foot All Natural Kids Teepee. Letting my children's imaginations run wild as they eagerly run in and out of their special little personal space. The tales they would create, the tea parties with their teddies and dollies. What a magnificent place for reflection and a quiet read of a treasured book, reading it out to their little cuddly friends. And I'm sure it would be an enticing place for our toddler to crawl into at night, equipped with big soft pillows and oodles of snuggly blankets. We could set it up so easily in our room and it could act as the perfect transition place for her to sleep, instead of sneaking into our bed in the middle of the night. I think everyone can certainly tell by looking at us next morning that we have had another very unrelaxed, broken sleep with her in bed with us - yet again! A fairy door would spark the imaginations of my kids; an invitation to dream up wonderful stories and adventures. To have the leisure to get caught up in a land of make believe and dreams is the wonder of being a child. 52 Amazing Science Experiments because I love science and would enjoy teaching and learning with my kids. I would choose the kenetic sand. I think it would help my very excitable 18 months old learn the advantages of calm play. If we don't win will still be purchasing as I am struggling with ways to help him calm down. Hope we win would love this. My son will choose the kenetic sand because it will help his motor skills as well as my daughters. They have played with it before and they both loved it. Its a good use to develop in with there learning for both of them. Love the fairy doors. My daughter just loves fairies. And loves to put on her tinkerbell dress and fly with the fairies. My daughter has tried the kinect sand and OMG is in love with it she builds towers snowman called Olaf. My daughter doesn't like normal sand cause it goes everywhere but she will sit and play with kinect sand for hours. I love playing with the sand it's a good mother daughter bonding fun.